Must have for wand collectors and children show workers! The wooden breakaway wand is one of a kind that measures a large 36cm long and 2cm in diameter. It can be seen clearly on any stage and looks really big in a kid's small hand. That means you double the fun and more laughter! Custom made hard wood sections with permanent dyed color. This will last for as long as you can keep it. 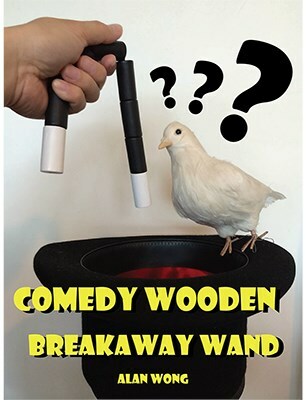 Comes with the extra piece that holds the wand together and when you pass it out to someone else, you secretly remove the extra piece and the wand will breakaway to pieces dangling around in their hands. Always get good laughs, now it is bigger and in higher quality. This is a limited production.